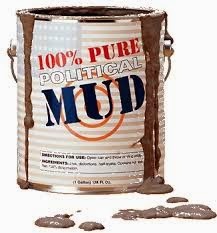 Most Americans won’t have to endure this sort of despicable slander and mud-slinging until closer to the November election but here in southwest Florida we’re already knee-deep in the muck otherwise known as political advertising. That’s because we’re in the midst of a campaign leading up a primary to choose candidates for a general election in May to replace our Congressman, who resigned after a cocaine bust. There are four Republicans in the race. Three of them – Lizbeth Benacquisto, Curt Clawson and Dr. Paige Kreegel – are running nonstop commercials. I haven’t bothered to see how many Democrats are vying to be their party’s candidate because it doesn’t matter. The winner of the Republican primary will take the general election. Southwest Floridians would elect Kim Kardashian if she were running as a Republican. Never have I seen commercials so full of obvious lies, distortions, overpromises and character assassinations. One can’t help but wonder how much money and/or power these folks have been promised they will enjoy when they get to Washington because nobody with an iota of integrity would compromise themselves like this for anything but money and/or power. A Super PAC called the Liberty & Leadership Fund (which conveniently has the same address as the PAC that supports the Florida Republican Party's hand-picked candidate, Benacquisto) is running a commercial claiming that Clawson, when he was the CEO of a company, refused to allow workers to call the fire department following an explosion in one of his factories, which resulted in the death of an employee. In short, the PAC is implying Clawson is a murderer. Clawson is running a spot saying he did what he could – he prayed (an obvious attempt to pander to the religious right) and met with the man’s survivors. Dr. Paige Kreegel, under the auspices of a PAC called “Values are Vital,” is running spots claiming Benacquisto is a closet Democrat who supports Obamacare and has raised taxes more than 150 percent, and that Clawson bankrupted his company and donates money (undoubtedly stolen from taxpayers) to Liberals. Kreegel claims he is the only true conservative who believes in freedom and liberty (which, last time I checked Webster's, mean the same thing). Since the race is clearly predicated on overpromises and/or character assassinations, I have taken the liberty of creating a simple template their respective campaign managers can use to create future commercials for these scumbags candidates. ( ) will personally stop any hurricanes headed this way. ( ) is the love-child of Nancy Pelosi and Kim Jong Il. ( ) believes in freedom for every American. ( ) wants to take away your right to shoot anyone who sets foot on your property. ( ) believes in families. ( ) spent billions in government bailout funds on drugs. ( ) couldn’t change a light bulb unless Harry Reid was holding the ladder. ( ) stands for independence. ( ) the only human in the race – the others are space aliens posing as earthlings. ( ) the true conservative who believes in America. ( ) know the voters of southwest Florida are gullible enough to fall for this message because focus groups don't lie. ( ) can't wait to get to Washington because I love the change of seasons! ( ) am a lying meglomaniac who will say anything to get elected. ( ) personally approve this message. It's a boy! It's a girl! It's ... Mystery Baby! If all goes according to plan, It will be arriving about this time next month. “It” is my wife’s and my nickname for the bundle of joy our son Ben and daughter-in-law Heidi are expecting – our first grandchild. I tell them the truth: I dunno. Everyone in both families and all of Ben and Heidi’s friends know but us. We don’t want to know. So far, so good – nobody has spilled the beans and it surely hasn’t been easy for them to keep a lid on It. Heidi, for instance, recently emailed that we’re being invited to a baby shower. The other guests are getting invitations that are gender-specific. Ours is going to be like Switzerland – neutral. And we’re not attending because the gifts would reveal something we don’t want to know quite yet. Heidi's aunt, my Facebook friend, posted the other day that she has been shopping for a "special" baby who will be arriving in a month. Thanks, Denise, for remembering we want to stay in the dark until the moment we get the call that It is here. We think we know what It will be. We even think we know what they are going to name It but we haven’t discussed that with the parents-to-be for obvious reasons. On the other hand, we’ve been wrong before. We were confident we knew what son Stuart, whom we had spent nine months imagining as daughter Catherine, was going to be right up to the second he was delivered. We could have found out in advance but chose not to. We have always been glad we didn’t. One thing about growing older is that nothing truly surprises you any more. By the time you're old enough to be a grandparent you’ve pretty much seen it all. But It will be a surprise. And whatever It turns out to be will be exactly we wanted all along. Shopping in southwest Florida, where half the population is comprised of elderly folks who are impervious to anyone but themselves, can be maddening as I was reminded once again yesterday. Where: The deli counter of my local Publix Supermarket. When: 5:30 p.m., the busiest time of day. A dozen or so shoppers are milling about, numbered paper tickets in hand, waiting to be served. Cast of characters: A thirty-ish male clerk wearing a hairnet working behind the counter, an eighty-something woman and – in two brief guest appearances – your faithful correspondent. Clerk (standing behind the counter, speaking loudly as he looks around trying to identify the next customer): Number 32. Number 32. Thirty-two anyone? OK then, 33. Woman (holding her number up and regarding me accusingly as if she has caught me lifting her wallet from her purse): Wait one minute, I was here first! I’m 32. Clerk (turning from me and toward her): Sorry about that. How can I help you today? Woman: I want some ham. Clerk: Will that be Boar’s Head or Publix ham? Clerk: We sell a lot of both, but Boar’s Head costs more. Many of our customers say it’s worth it. Woman: I wouldn’t know, I don’t generally order lunch meat. It’s disgusting what they put in it. Boar’s Head, I guess. I’m making sandwiches for my bridge group. Clerk: What kind of ham would you like? Woman: What are my choices? Clerk (leaning down behind the counter and opening the glass door to read the labels): Let’s see, we have Deluxe … Black Forest … Tavern … Maple Glazed … Pepper … Pesto Parmesan … Low Sodium … and Rosemary and Sundried Tomato. Woman: Would you repeat that? I can’t hear you when you’re hiding behind the case mumbling like that. Clerk (standing up and gesturing toward the hams in the glass case): There are signs in front of each type. Woman (30 seconds later after she has carefully examined the signs): Pesto Parmesan. That sounds ... interesting. Clerk: Would you like to try a slice? Woman: What’s that green stuff? Clerk: It’s Italian – garlic, basil, olive oil and, if I remember correctly, ground up pine nuts. It’s pretty good over pasta. Clerk: OK then, do you see anything else you might like? Woman (after again examining the ham varieties closely): Black Forest. Clerk: Excellent choice, my personal favorite. Woman: I bet you have to carry that because of all the Germans who winter here, right? Clerk: I can’t answer that m’am, but it is popular with our German customers. Clerk: No, my family’s Italian. Woman: No wonder you recommended that – what was it you called it? – Presto. The one with all that garlic. Clerk: Would you like to try a slice of Black Forest? Woman: No. My next-door neighbors are from Dusseldorf. It might be Stuttgart. I’m not sure, I don’t really talk to them. In fact, I don’t like them so I wouldn’t like German ham, it would remind me of them. They flew home yesterday and I’m not going to miss their comings and goings for one minute, believe you me! Clerk: You probably want the Deluxe Ham then – a traditional ham, nothing added to it. Woman: Let me try that. Woman (after tasting it): Yes, that’s exactly what I had in mind. How much is that? Clerk: It’s $9.69 a pound. Woman (taking a step backward and pointing to the hams in the case): Well! That costs the same as the other, fancier hams! Why are you charging just as much if it’s easier to make? Clerk: I don’t set the prices m’am, but it’s our most popular ham. Woman: That doesn’t seem right. Clerk: The Tavern ham is on special this week – $8.69 a pound. Woman: I don’t drink, so I don’t want Tavern ham. Clerk: There’s no alcohol in it. Woman: Then why do they call it ‘Tavern’ ham? Clerk: I wouldn’t know. Would you like a sample slice? Woman: Of course, I'm not going to serve my guests something I haven't tried myself. Woman (reluctantly): I guess that’ll do. Clerk: Great! How much do you want? Woman: Four slices. And slice them thin. Clerk: You want four slices of Tavern ham? She: Isn’t that what I just said? Clerk: And you want them ... thin. OK, coming right up. 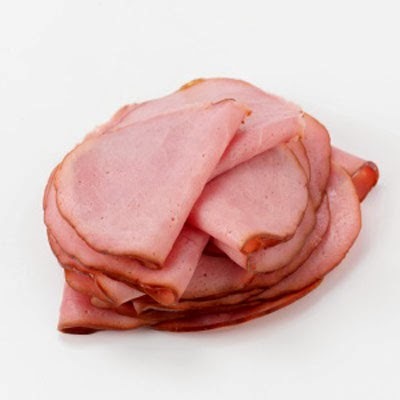 (He removes ham from case, takes it to the counter, removes the cello wrap and places it on the slicer. He slices one piece, and presents it to her.) Is that thin enough? Woman (waving her hand dismissively): No. Thinner. Clerk: All rightie then, thinner it is. (He adjusts the slicer and shaves off another slice he holds up for her approval.) How’s that? Woman: If that’s the thinnest you can get it … go ahead. Clerk: There you go, have a nice day. (Turning to me.) Sorry for the wait. How can I help you? She: Just a minute. I want some cheese. 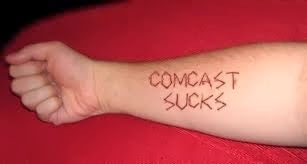 Thank you for calling Comcast, home of Xfinity tv, telephone and internet. Oooga chucka oooga chucka macaroni macarena press uno. For quality or training purposes your call may be monitored by someone who doesn’t speak English but hopes to soon. To report an outage in your area, press one. To report an outrage in your area, press two. To order The Sound of Music starring Carrie Underwood on our pay-per-view service, press three. If you are having problems with your Internet service, press five nine four six three three nine seven zero nine two three four six two. If you are having problems and have been drinking too much (or, if you are located in Colorado or Washington, smoking more weed than you should), press four two zero. If your telephone isn’t working, you have a cell phone – you made this call, didn’t you? – so this isn’t a real emergency and you should hang up now because there are some seriously pissed off people who have worse problems than you out there trying to reach us. If you have a billing question, press nine. If you don’t know me by now, you will never never never know me. Whooooa. If you are calling to complain that NBC, which we own, only has two shows in its primetime line-up – The Voice and Celebrity Game Night – give yourself a star by pressing “star” on your telephone’s keypad because you are right and smarter than any of the dim-witted has-beens who appear on Game Night in a pathetic attempt to appear relevant. If you are calling to complain that MSNBC, which we also own, is too liberal for your tastes, bite us. We give money in equal amounts to both parties. How else do you think a regulated monopoly that treats its customers like we treat you could be allowed to exist? If your cable television isn’t working and you haven’t already tried disconnecting the input cable and unplugging the box, press three nine. If your cable television isn’t working and you did try disconnecting the input cable and unplugging the box, do it again because you obviously didn’t do it right. And don’t even think of pressing zero if you are under the impression we’ll connect you to a human because the last one left the building in 1999. If you would like us to send a “wake-up call” to your cable box or internet modem in the hopes that will shock it into working, click your heels together three times, say “there’s no place like home” over and over, then press six six six. If you don’t understand why birds suddenly appear every time the person Karen Carpenter is singing about in “Close to You” comes near, come sit by us – we don’t understand it either and have always found it disturbing. If your dog consumed the contents of an entire bottle of Marie's Blue Cheese Dressing and did diarrhea and your Roomba robot vacuum ran over it and the gears got clogged up call Heather in our Paducah office because the same thing happened to her and she was able to getting it working again. If you are calling to disconnect your service, please call back between the hours of 11:59 p.m. and 12 midnight on February 29 when that department is open. If you would like to hear this menu again, press two. My wife and I recently purchased a new house. OK, it's not actually new. It was built in 1993. And we don't own it yet. We take possession in late May. Whatever, I ran into the current owner while I was riding my bike the other day. I stopped to chat and he introduced me to a woman who was walking by. He said she'll be our new neighbor. She didn't seem very friendly, frankly. In fact, she looked me over, top to bottom, then rushed off as if she couldn't wait to get away. I told my wife about it when I got home, and she pointed out what I had forgotten: I was wearing a t-shirt my son gave me several years ago, a shirt he bought because he thinks it's funny I am constantly emailing him photos of our dachshunds. 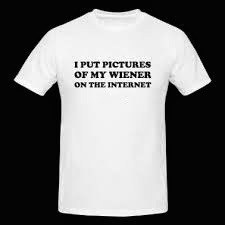 It says, "I put pictures of my weiner on the Internet." We really should ask her over for a drink once we move in. I wonder if she'll come?